Strength. Reliability. Low weight. Durability. These are the qualities we demand from all the materials that we use, and we have rigorous standards that every material must meet. Such materials are almost always more expensive, but they also yield a final product that substantially outperforms one made with even slightly lower quality materials. 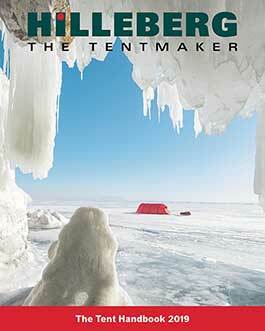 It is that kind of exceptional performance that is the hallmark of Hilleberg tents. We are also constantly testing that performance, from the strength and durability of our fabrics and poles to the reliability of our zippers, guy lines, line runners and fittings. We use lab tests and field tests, and we are always seeking better material solutions. A tent’s fabrics are what protects you from the elements. In a Hilleberg tent, those fabrics must perform to exacting criteria in a number of areas, which we check in the lab, with standardized tests, as well as in the field. Hilleberg Kerlon outer tent fabrics must meet a specific tear strength (see “The Importance of Tear Strength”), as well as a minimum waterproofness rating, or “hydrostatic head,” and a minimum color resistance to light. While the outer tent’s fabric keeps the elements out, the inner tent fabrics must serve to keep the occupants as comfortable as possible. Our inner tent fabrics are very lightweight and both air permeable and highly breathable, so they let moisture vapor escape while keeping actual water drops from penetrating. Also vital to the tent’s performance are its floor fabrics. Ours are not only extremely waterproof, but are also highly puncture and abrasion resistant, and will stay flexible even in the coldest temperatures. Coated on both sides with a total of 3 layers of 100% silicone, and treated for UV resistance during dyeing and coating. The Atlas and Stalon XL inner tents are made with the Black Label inner tent fabric. The Altai inner tent is made with the Red Label inner tent fabric. The Atlas floor and the Stalon XL floor are made with the Black Label floor fabric. The Altai floor is made with the Red Label floor fabric. We use one of the certification standards from the international Organization for Standardization (ISO) to establish our fabrics’ waterproofness. Other, less reliable testing procedures could conceivably produce much higher figures, but since there is no industry-wide standard, we chose the worldwide, ISO method. This can make comparing different brands’ figures difficult. Because we are comitted to longevity in our products, we also test fabrics after they have been exposed to weather and mechanical wear so that, beyond their guaranteed initial waterproofness, our fabrics will perform well even after some time of use. A high performance tent must have a skeleton worthy of the strength of its skin. We use DAC poles, because we believe they offer the kind of superior performance that our fabrics do, and on most models, we use the DAC Featherlite NSL poles. The section-connecting inserts on the NSL poles are nearly the same diameter as the pole section itself, so the poles are both significantly stronger and lighter than standard-style poles. We select the optimal pole length(s) and diameter for each tent model, and, if necessary, we pre-bend them. 9 mm poles go into both our Yellow Label and our Red Label models because, like these models’ Kerlon 1000 and 1200 outer tent fabrics, they offer plenty of strength at a very low weight. We use stronger 10 mm poles with our Black Label tents, since these are designed to handle the most extreme conditions. We choose and evaluate the other materials on our tents – zippers, guy lines, pegs, and other fittings – with the same rigor we apply to fabrics and poles. We use YKK zippers, which we have found are the strongest and most reliable available. Our proprietary guy lines are a blend of super strong Vectran fibers and polyester, uniquely interwoven so there is no sheath to separate from the core. They are very light and strong, absorb almost no water, and have negligible stretch. All of our tents come with the appropriate aluminum pegs: extra robust yet quite light pegs with the Black Label tents; very light and strong pegs with the Red Label tents; and super light but still quite strong pegs with Yellow Label models. Smaller fittings are equally well-considered. The simple polymer line runners will hold tenaciously even on wet or frozen cord, and yet can be easily adjusted. The polymer pole clips, pole tensioner cups, the metal ladder lock buckles on pole and peg tensioners (we use metal because these buckles must be as strong as possible) and the adjustable peg loops are all immune to wet and cold, and can be operated easily, even while wearing bulky mittens.